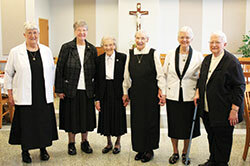 Four Benedictine sisters who celebrated special anniversaries of their religious profession at Monastery Immaculate Conception in Ferdinand, Ind., in the Evansville Diocese, also have ties to the Archdiocese of Indianapolis. 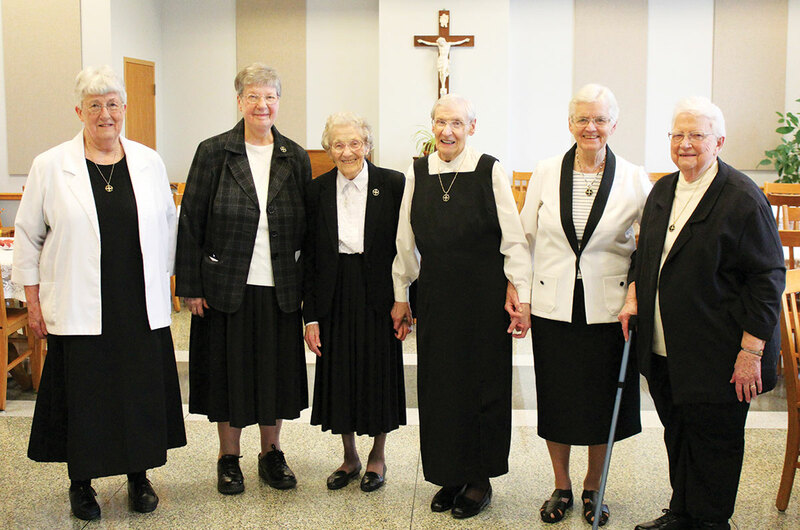 At the monastery on Oct. 29, Benedictine Sister Sylvia Gehlhausen marked the 70th anniversary of her profession of monastic vows, and Benedictine Sisters Jan Youart, Mary Agnes Sermersheim and Corda Trouy celebrated their 60th anniversary. Benedictine Sister Sylvia Gehlhausen entered the monastery in 1940 and made monastic profession in 1942. In the archdiocese, she served as a teacher at St. Mary-of-the-Knobs School in Floyd County, at the former St. Meinrad School in St. Meinrad, and at the former St. Bernard School in Cannelton. She currently serves as a minister of hospitality at the monastery. Benedictine Sister Jan Youart, a native of Shelbyville, entered the monastery in 1955 and made her monastic profession in 1957. She served as a teacher at the former St. Meinrad School in St. Meinrad. She currently serves at the monastery in the ministry of prayer. Benedictine Sister Mary Agnes Sermersheim entered the monastery in 1955 and made her monastic profession in 1957. She served as a teacher at the former St. Meinrad School in St. Meinrad. She currently serves as sacristan, works in the liturgy office and helps with health care at the monastery.